Once upon a time, in a land far far away (okay, not that far away.....just down in Utah County) lived a beautiful Native American princess named Ucanogos. Minutes after her birth, her mother died from complications, and the sole responsibility of raising her fell on her father's shoulders. Ucanogos was a very happy child, and loved hiking in the mountains above their little village. As the years passed, she grew more beautiful with each passing year. Her beautiful flowing hair grew longer and longer, and the longer it grew, the more she reminded her father of his beloved wife. As the beautiful princess grew, so did the list of many young men in the village that longed to have her by their side. Being his only daughter, her father tried to find a suitable gentleman for her to marry. Nobody was ever good enough for her, and many young men were turned away. Feeling discouraged, Ucanogos went for a walk up the beautiful mountain trail above the village. Her favorite quiet place were the caves at the top of the mountain pass. This was the only spot where she truly felt at peace. One day while exploring the caves, Ucanogos heard a noise. Out of the shadows appeared a handsome young man named Timpanac. He had sparkling green eyes, broad shoulders, and a friendly smile. He had been sent by his village leader to explore the villages and mountains beyond, and had been led to the beautiful caves. Something about these mountains and caves had sparked an interest in him, and he could not stay away. The beautiful princess immediately fell in love, and knew that this was the man of her dreams, the one she had been waiting for. Excited to tell the entire village that they had found each other, Ucanogos and Timpanac decided to wed immediately. They headed down the path towards the village, but a mountain rainstorm quickly blew in. Not familiar with the mountain path, Timpanac slipped and fell, plunging to his death. Devastated, Ucanogos vowed she would not live without him. She lept off the mountain, plunging to her death. When she landed in the grass below, she fell onto her back, her flowing long hair cascading behind her. Her knees were up, and her arms were out to her side. 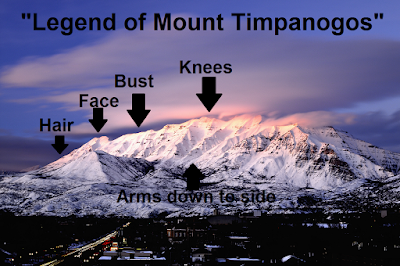 Legend has it, that if you look close enough at Mount Timpanogos, you will see the silhouette of the beautiful princess: laying on her back, her flowing her cascading behind her, and her knees bent upward. This is where she is forever laid to rest, watching over her village town. If you walk the mountain path and venture into the caves on Mount Timpanogos, you will see where the great spirit melted their hearts together to create the Great Heart Of Timpanogos, a stalactite inside the cave. Take the tour of the caves with a guide, and you are sure to hear of this great legend, and view the stalactite. Is this legend true? Gaze at the mountain, and venture into the caves, and decide for yourself! You can read more information about hikes and tours on the Mt Timpanogos website. This is a hike that I remember doing as a young child. The path is paved and a great hike for families. Remember to take a jacket, even in summertime, because the caves are a little bit chilly. Read more about Utah's Mysteries and Legends! She is easier to see from the Heber side than from the Provo side IMO.